Jewish child in town. 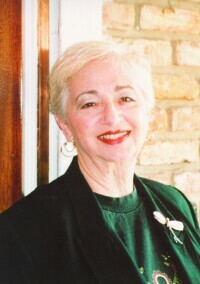 When her children were growing up in Louisiana, they were the only Jewish family in the entire parish. As a family they shared in Toby's experiences of practicing a religion that was not as well recognized as the faith found in their friends' homes. Learning to share her faith with her friends, she quickly understood that children should have an appreciation for other religions. She never considered herself much of a teacher, rather devoting her time to raising a family and working in the family business. But in 1972, she decided to go to college. Taking one course a semester, she completed her studies with a master's degree in education with a concentration in children's literature. This grand commencement from the University of New Orleans took place just months after the release of her first book, Toby Belfer Never Had a Christmas Tree. She now teaches children's literature on the college level at Loyola University in New Orleans and focuses on the need for elementary school teachers to use books more effectively in the classroom. She has also worked hard at passing the culture on to younger generations. This doesn't just apply to her seven grandchildren. In school appearances all over the country, she gives children a firsthand look at the customs, clothing, and childhood stories of the Jewish people. Priding herself as a storyteller, she has spoken to classes in a number of states and in schools from public to parochial to synagogue Sunday school classes. Teachers, parents, and students alike find her presentations enriching and entertaining. One to recognize that learning does not stop, she is continuing her own education on the doctorate level. She holds memberships in both the National Association for the Preservation and Perpetuation of Storytelling and the Coalition for the Advancement of Jewish Education. Toby Belfer is now in the fifth grade, and she and her best friend Donna take a trip to Israel to tour the Holy Land. There, the girls visit Yad Vashem, the Holocaust History Museum where they learn about the Righteous Gentiles, the Christian men and women who aided persecuted Jews during the Holocaust. Toby Belfer’s great-grandmother’s family lived happily in a small town in Poland. When a group of soldiers came into the town and threatened its inhabitants, the family decided to leave. It was hard coming to America in 1904. All of the passengers, including people from all over Europe, were nervous about learning English and adapting to the new laws and customs. As they arrived, all the immigrants had to form lines and answer question after question before they could see a doctor and be on their way. Hardcover. Welcome to the Belfer house, the only Jewish home in a small South Louisiana town. The celebration of Passover is coming and Toby Belfer’s best friend, Donna, is coming over to share in the festivities of the Seder supper. Donna does not know much about the celebration of the Seder because at her church they celebrate Easter. During one magical night she will experience the traditions and learn the history of the Jewish feast of deliverance.